As of right now I am unfollowing anyone on Facebook who posts disturbing pictures. This week I’ve seen twelve dead babies, countless abused animals and one snapshot of two thugs hanging a terrier puppy. I neither want nor need these things in my mind. I should first say that two of my favourite books of all time are _Pillars Of The Earth_ and _The Winds Of War_. I had hoped that Follett would do for WWI and the Russian Revolution what Wouk did for WWII. I love these types of historical fiction, where the seemingly-dry events of days past come to life through the eyes of characters and the situations in which they find themselves. The first third of the book is extremely promising, as Follett brings all the players on stage and uses his superb skill at crafting characters to get the reader invested in this story. But then the worst thing happens. We get to the assassination of the Archduke Franz Ferdinand, and just as that set the world on a collision course, that event does the same thing for the book. I suspect that Follett wrote this during the same period that he was adapting (poorly) Pillars of the Earth for television. Because once the events unfold in Sarajevo the book turns into a horrible teleplay. There are still good narrative scenes surrounding the more private dramas of central characters. People give hand jobs in opera houses, have family dustups, all sorts of things one expects to find in a novel. But whenever Something Historical needs to happen, Follett falls back on Teleplay 101. He gets his characters in a room. Dinner Parties, brunches, tea–pick a meal, pick an excuse. Without fail he describes the food briefly and then has two characters on ideological opposing sides start having a “conversation” where he lays out the dueling ideologies of the time. From Sarajevo onward a full third of the book’s text is comprised of expository dialogues set in the dining rooms and restaurants of the world. It feels both incredibly lazy and horribly contrived. This is, in my opinion, where “Show, Don’t Tell” has become a curse to the writing world. Whereas Wouk doesn’t shy away from infodumps in _Winds_, he does so in a way that completely engages the reader. Here Follett is “showing” by means of turning his infodumps into dialog. And it is boring, boring stuff. If the book were smaller, it would have been better. If it were larger it might have been better. As it stands now, it’s only merely a good book because of Follett’s genius with characterisation. If you want a similar read I suggest either Wouk or (even, dare I say it) Jeffrey Archer. This is only recommended if you REALLY love Follett and are REALLY curious about what one British guy thinks about WWI and the evils of communism. I just got hit with the most random realisation ever. The places I hurt the worst and most frequently are my hands and feet–thanks to arthritis–and my abdomen on the upper & lower left quadrants. It’s been this way for years but just now it occurs to me that I have a sort of bloodless stigmata. A constant reminder of just exactly what Jesus went through and why he went through it. Over at Mike Duran’s blog yesterday the topic was the general unfairness of life. Given the fact that I’ve been on both the winning and losing sides of the fairness game I tend not to participate in those kinds of things. It isn’t perhaps seeming fair that I couldnt have children but some other person who seems unsuitable can. And it doesn’t seem fair that I live in a nice house while others are in the street. Trying to weigh a life’s inequities is an exercise in futile frustration. My mother’s response when we would complain about this or that not being fair was always to tell us that in a fair world Jesus wouldn’t have died on the cross. When I posted a photo of our spectacular sunset earlier in the week I rhetorically asked whom I should thank for it if there were no God. One of my friends asked back why I couldn’t just “be thankful” without needing to thank anyone in particular. Now with hands and feet throbbing I think of the nails; with side clenched and aching I think of the Centurion’s spear. I need to thank someone in particular because there is someone in particular. Someone who chose this for my sake. I don’t know what’s happened to Facebook in the last two weeks. Around Christmas time it was a place where a lot of dialogue was happening. Now it’s bumpersticker-funny picture central. I think most people are probably too downcast to be comfortable sharing what’s in their hearts and so they resort to the constant recycling of motivational snapshots. It’s like going to a cocktail party where everyone is holding a favourite joke up on a stick like a mask while remaining mute. 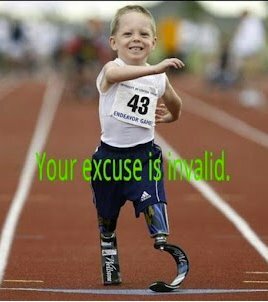 Most people look at that and see the boy’s smile, his human feet replaced with prosthetics and the fact that he’s about to bust through the slogan like the winner’s tape at the end of the run. The natural reaction is to think “what a darling child!” and “if he can run without feet, I can make it until 5:00pm and deal with this annoying coworker!” So they pass it on. What they don’t see is that there is a world of people out there–and yes, I’m one of them, which is why I’m reacting this way–who cannot run races because they are disabled by body parts that cannot be replaced. There is a world of people out there who are trying to come to grips with being told that they will never be able to [Fill In The Blank] because they have [Fill In The Blank]. And that’s not to mention the many people who are without feet AND don’t have the insurance money for fancy runner’s prosthetics. These things aren’t “excuses”, they’re real problems. In my world “you have dozens of irremovable tumors pressing against the nerves in your body” and “your immune system is destroying your joint tissue” and “your internal organs are fused together by the equivalent of Gut Kudzu” are real things I have to deal with every day. In my world getting out of bed is sometimes harder than running a race. But I do it. I used to love to run and I no longer can. Are those things excuses? Is there a way I can run even though multiple doctors tell me it’s the worst possible idea? I can swim, do yoga and pilates and other low-impact excercise. Which I do. But I can’t run. Is that an excuse? And is it _Invalid_? Touchy word to use with people like me in the first place. We used to be called that all the time, albeit with the accent on a different syllable. We know that for centuries society thought we didn’t matter. Now it seems society is enlightened enough to think that WE matter but that our PROBLEMS don’t. What glorious progress! It hasn’t been very long since I first heard the “Show, don’t tell” criticism that is so pervasive in creative writing circles now. I honestly wasn’t quite sure what was meant by it, and had to ask here what my readers thought it meant. Their responses made sense, and I came to understand it more as a valid criticism. Lately, however, I am starting to think that it isn’t as valid a criticism as all the workshop leaders and critique partners might want it to be. I’ve been re-reading some of my favourite books, books I love so much that I’ll read them the way other people snack on chocolate and chips. These are books I go back to when I am in the mood to read but can’t take on anything new or unfamiliar. They’re books I go back to when the world outside stops making sense and I want a place to hide. They’re also books that have outsold most other books. Maeve Binchy, Ken Follett, JK Rowling, Harper Lee, C.S. Lewis–those are all writers whose works are popular, profitable and about which people are passionate. Each and every one of those writers is a Teller. A storyTELLER who uses their skill to tell a story. Don’t get me wrong–other favourite authors like George R.R. Martin excel at showing, and through them I can see how it’s a useful tool in a writer’s kit. But more and more I am struck by how easy and comfortable a well-done Telling read can be. Different authors have different voices and methods, and I’m beginning to wonder if perhaps it isn’t actually very bad criticism to insist that all books must read like screenplays. Because that’s where I think the Show Don’t Tell rule has come from. It seems to be most evident in American books by American authors who have also written for movies or television or who hope that their books will be sold to movies or television. Looking back through my list I realise that with the exception of Lee (whose book honestly does a bit of both Telling AND Showing), all the best Telling authors are English, Irish, Welsh–they come from a place with a stronger tie to literature and to the past. They come from a place of writing, not movie-making, and their books are meant to be books first and foremost. After all, aren’t people forever saying that they liked the book better than the movie? It’s been a couple of months and a few major holidays since the Occupy Nashville fracas. Just in case you need a memory refresher, the governor created a new law out of the blue which made it illegal to protest on state property after hours. He then employed the TN State Police to arrest and detain members of Occupy Nashville while theatre patrons on the same property at the same time were allowed to move freely. During the arrests of protesters a journalist who identified himself as a member of the press corps was also arrested and detained. There were several days of this imbroglio and mountains of violations of the Bill of Rights. Most people were rightly incensed. Okay, many people. Because there were a few who felt that the Occupiers were such a scourge that the sacrifice of all our rights was completely justifiable. Needless to say I think those people are horribly wrong. Anyway, fast forward to now. Rand Paul went through the BNA airport screening system that I hate so much. I cried when facing it for the first time last September and still shudder to think about it. All the lines and standing in the scanner with your arms above your head in the classic position of surrender while your (albeit blurry) naked image is piped to another room so that they can be absolutely sure you aren’t going to blow anything up. Well, Rand Paul set off the scanner. When that happens, the standard procedure is to have a pat-down of your entire body–breasts and crotch included. It’s humiliating and violating and as much a violation of the Constitution as anything that happened in Legislative Plaza last November. Rand Paul* refused the pat down and was, like the members of ON, detained. I keep reading on Twitter and Facebook that the general mood is that Rand Paul is a privileged d**khead who is whining about being treated like regular people. I read this from the same people who elevated Occupy Nashville detainees as heroes. Frankly, I don’t see a bit of difference between what Rand Paul did and what the Occupy Nashville people did. Characterising one as a whiny son of priviledge and the others as crusading wunderkinds for the First Amendment is intellectually dishonest and tribalist thinking. “Rand Paul isn’t on our team so we can’t let him claim a place in the battlefront.” This type of position will do nothing but contribute to the rapid erosion of Civil Liberties for all sides of the political cube. The thinking behind that is to prohibit folks on the other side of the representative’s position from creating actual roadblocks that would prevent the elected official from exercising his or her duty. So those who complain that Paul is just whining “Do you know who I am?” are actually missing the point. Yes he’s making a point that he’s a Senator. He’s making that point because he has the Constitutionally-protected right to travel without arrest or detention to AND FROM the Senate.